BOSCH has just announced that its motorcycle-focused business, the Two-Wheeler and Powersports Division, is working on new products and will now be run autonomously from the rest of the company. Formed last year and based in Japan, the Two-Wheeler and Powersports Division is focused on developing and supplying electronic parts to the bike industry. Its 2016 offerings include an electric hub motor for scooters, plus a new generation of ABS designed for smaller capacity bikes. The latest anti-lock braking system is called ABS10 and is designed specifically for bikes up to 250cc. It will sit alongside Bosch's existing ABS9 system and be in production later this year. 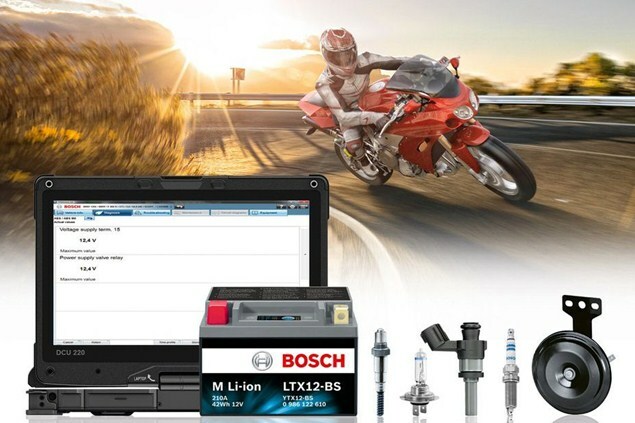 Bosch says ABS10 been developed as an affordable safety system for bikes in emerging markets. The new system will be 45 per cent smaller and 30 per cent lighter than the ABS9 unit, and available in two varieties – one channel (front wheel) or two-channel (both wheels). Bosch says it’s worked hard to make the new system a cost effective choice for cheaper bikes that may not otherwise be equipped with ABS. The firm’s other new product is the e-Scooter hub motor - a hub-wheel motor that can replace the rear wheel of a conventional scooter. It makes 2.4hp but has a boost function to provide a burst of extra power. For now, it will only be offered in China, where electric scooters are a popular way of getting around – there’s thought to be around 120 million of them in use. The new systems will complement Bosch’s most recent motorcycle technology – Vehicle Hold Control (which will come as standard on the new Ducati Multistrada Enduro) and side view assist, plus the newest incarnation of the firms inertial measurement unit which can be found in the new KTM 690 Duke R.